RUNNING NOW is the Morrison's Bonus Cash Derby. Come join the fun on today through November 2nd for a chance to win $2000 in cash prizes. We stocked 12 tagged fish with corresponding values from $50 to $1000. Rick Vega (photo on the right) was the first to land a money fish. It was a 4 pound 8 ounce Rainbow. I'll be sending out a derby update email early next week with all the winners and cash values. If you are interested in increasing your chances of landing a tagged fish, get out on the lake in a boat. If you want to reserve a boat call us at 760-934-3800 Ex1. Our marina will remain open until the end of the fishing season, November 15th. 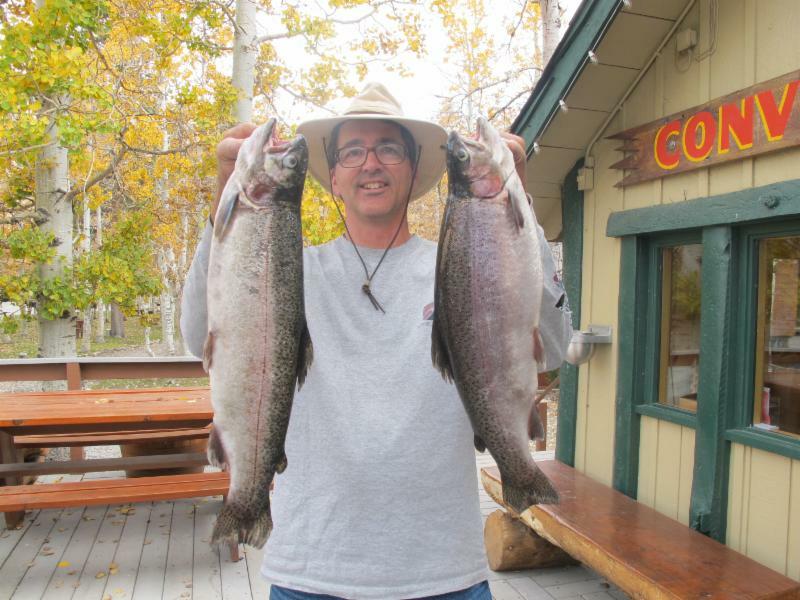 Catch of the Week: Congratulations to Dan Crose from Simi Valley, CA with two excellent rainbows pulled from Convict Lake along the North Shore. 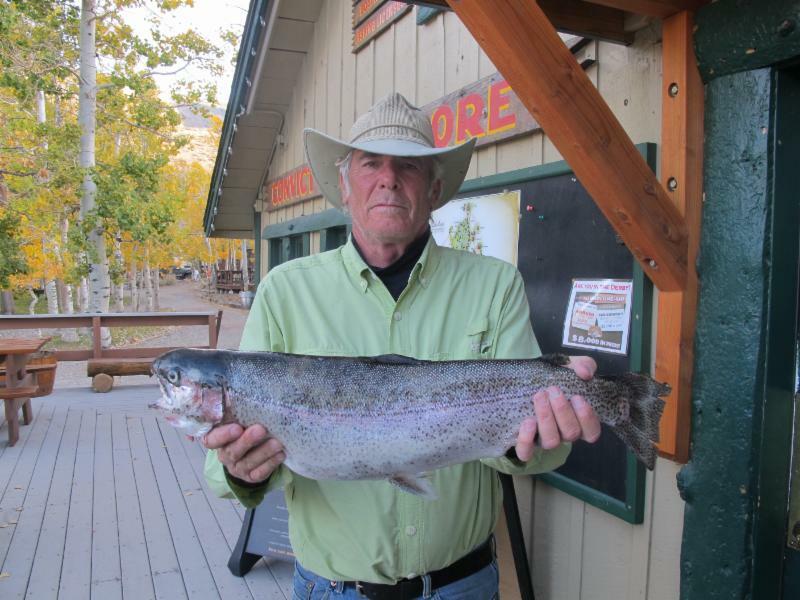 He was using a Thomas Buoyant when he scored a stout 4 pound 5 ounce rainbow for the "catch of the week". The second fish was 3 pounds 12 ounces. Great job Dan! homas Buoyants, Power Worms (Pink & Red) and Mini Jigs were doing well at the lake this week. The top trolling lures were Needlefish and Tasmanian Devils. Powerbait Power Eggs and Garlic Powerbait landed some nice fish. The most successful Powerbait colors were Rainbow and Salmon Peach. Marvel Flies, Sierra Slammer Swimbaits or Sierra Slammer Worms would also be a great choice of tackle for this time of year. Some of the top Marvel Fly colors are olive, brown and purple. While using the Sierra Slammers try Baby Rainbow, Brookie or Golden. The North Shore was the hot spot. Other locations fishing well were the Inlet, Windy Point, Hangman's Tree, Jetty and North Shore. Weather: Winter Storm Warning in effect from October 31, 05:00 PM PDT until November 1, 11:00 AM PDT. By Monday the storm should move out of the area and the temps will be on the rise throughout the week. By Thursday the high is forecasted to be in the low-60's. Here is the National Weather Service link that is usually quite accurate: 7-Day Forecast Convict Lake. Sunrise - Sunset: Sunrise this week 7:21am (11/1/14) - 6:27am (11/7/14) and Sunset 5:59pm (11/1/14) - 4:52pm (11/7/14). Don't forget to set your clocks back tonight. Stocking: 400 pounds of trophy trout were planted at the lake on October 30th. Thank you for your continued interest in Convict Lake. For more information please contact us or visit our website www.convictlake.com.